The DXS Series of active subwoofers from Yamaha Pro Audio consists of the DXS12 and its larger sibling, the DXS15. Both are compact, high-output units that are designed to complement the company's DXR and DSR full-range loudspeakers, and they're also useful for adding low end to any system. The DXS12 is the smaller of the pair, but packs quite a punch for its size. 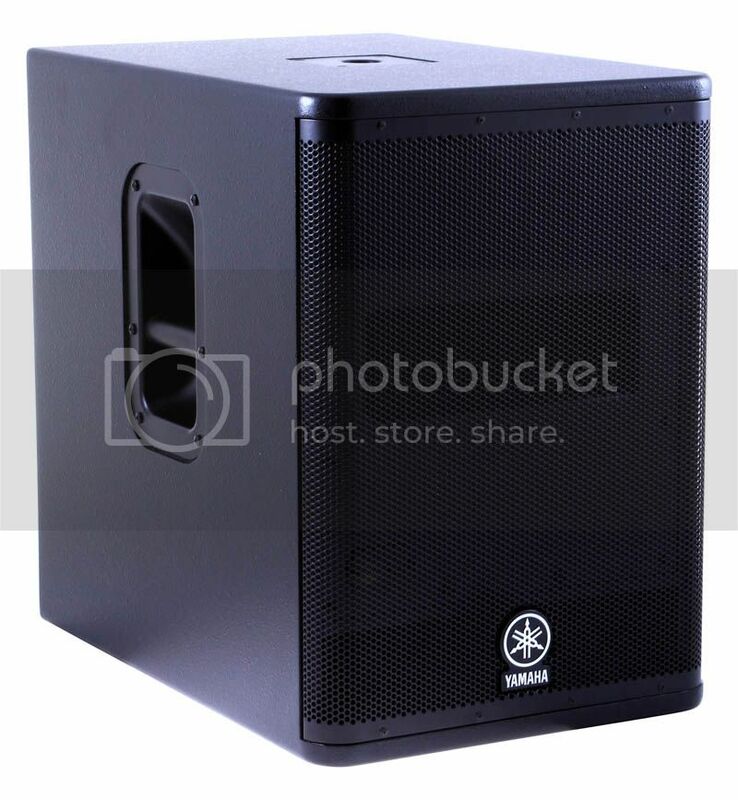 It incorporates class D power amplifier rated at 950 watts driving a single 12-inch woofer in a band-pass configuration, housed in an all-wood cabinet that's covered with a durable paint finish and fronted by a sturdy 16-gauge powder-coated steel grill. Frequency range is stated as 47 Hz – 160 Hz (-10 dB), with maximum output of 131 dB SPL. 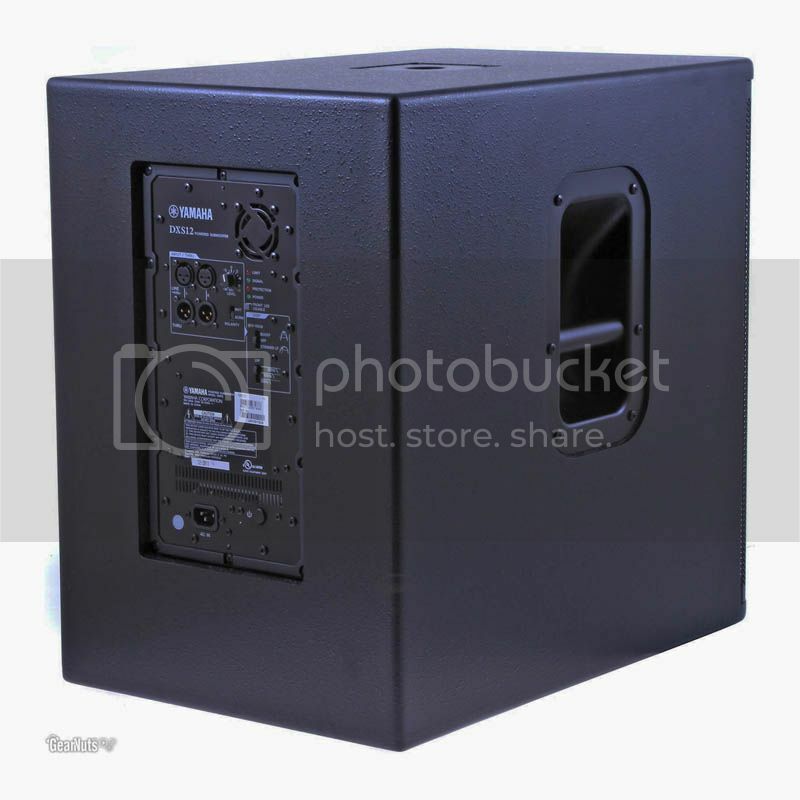 The enclosure includes a pole cup mount on the top as well as large side handles that are well-placed, and it measures 22.2 x 15.6 x 23.4 inches (h x w x d) and weighs 72.8 pounds. The rear panel sports left and right XLR inputs, along with XLR outputs, a polarity switch and a volume knob. They're joined by limit, signal protection and power LEDs. DSP controls include a 3-position boost/bass switch and 3-position low-pass filter switch. An IEC power input, power switch and front LED disable switch complete the controls. The DSP section, based upon new, proprietary D-XSUB processing, provides a choice of normal, boost or "XTENDED" settings. The boost setting provides a tighter, more focused bass signature, while XTENDED mode adds depth to low-end frequencies. The previously noted LPF switch allows adjusting the filter between 80, 100, and 120 Hz settings. Out of the box, my first impression was that the unit is indeed very compact and the large handles on each side make it comfortable to pick up and move around. The wrap-around front grill enhances a nice clean look. Set up in the shop, we thumped the box a bit and with no real reference for comparison, I thought the output was a bit low, so I set up a single-18-inch powered sub to compare against. The DXS12 was easily as loud, if not a bit louder -- especially at the top end of the frequency range -- than a cabinet twice its size! I then swapped in a few different full-range cabinets to see how a complete system would sound, and the DXS12 did not disappoint. The bottom end is solid and the adjustable LPF settings allowed me to match the sub to a variety of different tops. I also like the ability to be able to voice the cabinet with the DSP switch. Certain gigs might warrant the extended LF setting, while others might benefit from mid boost voicing or having the sub run flat. In the shop and at a gig, I found that I most preferred the extended LF setting. Next, I had the opportunity to deploy the DXS12 at a gig, a corporate event that required LF support of a playback system. I paired it with some active loudspeakers and covered a large lobby area for a crowd of more than 300 people. This sub was the perfect size for the job, small enough to blend in and large enough to fill the space with plenty of pleasing bottom end. The DXS12 is a great all-around compact subwoofer. It’s an attractive package, is easy to move, offers useful tailoring capability, and has a lot of thump for its size. While I was in the process of evaluating the DXS12, Yamaha also sent me a new STAGEPAS 600i highly compact, portable PA system to check out. 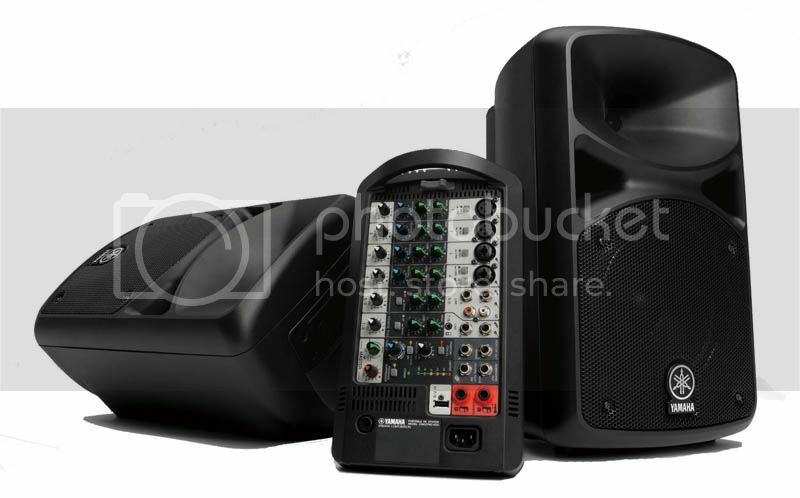 Both it and the smaller STAGEPAS 400i system consist of a stereo powered mixer, two loudspeakers, and a pair of loudspeaker cables with 1/4-inch connectors. While many powered loudspeakers these days have a basic mixer built into them, Yamaha has a different take. The 10-channel (4 mono mic/line plus 6 mono/3 stereo line) STAGEPAS 600i powered mixer (680 watts, dynamic) drives both 2-way, passive loudspeakers that are each loaded with a 10-inch woofer and 1.4-inch voice coil compression driver feeding a waveguide molded into the composite cabinet that provides 90- x 60-degree dispersion (h x v). 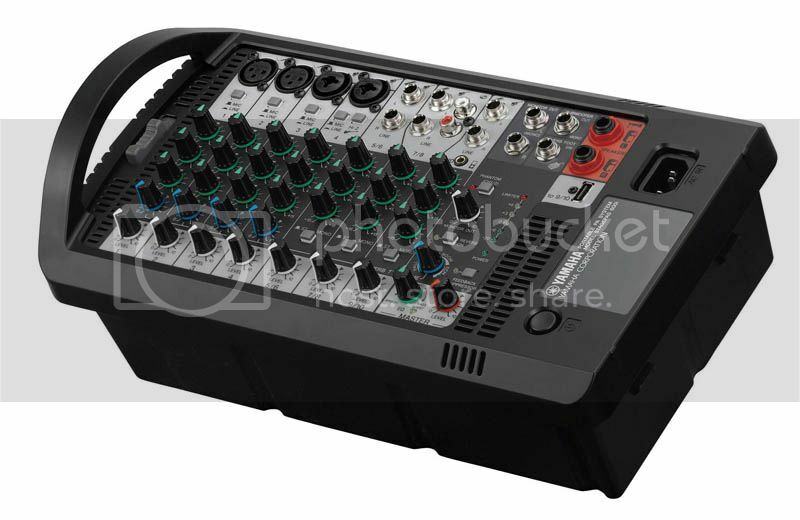 The mixer, which can be used as a stand-alone unit or snapped into the back of one of the loudspeakers, also has 2 mono channels with XLR inputs and 2 mono channels with XLR/TRS combination jacks. All 4 mono inputs have mic/line switches, 3-band EQ, reverb knob and level control, and channel 4 also sports a high-impedance switch. Channels 5/6, 7/8, 9/10 offer a pair of 1/4-inch inputs, with channel 7/8 adding a pair of RCA jacks and channel 9/10 equipped with a 1/8-inch TRS jack as well as a USB iPod, iTouch or iPad input that also supports charging while using it for music playback. The stereo channels all have 3-band EQ, a level control and also each feature a stereo/mono switch. The master section has the main level control, a master EQ knob, monitor level knob, feedback suppressor switch, reverb select and adjustment knob, reverb on/off switch, phantom power (channels 1 and 2) switch, and a 6-segment meter. Output connections include 1/4-inch jacks for the loudspeakers, 1/4-inch stereo monitor output jacks, 1/4-inch subwoofer output, and a 1/4-inch jack for a footswitch to turn on/off the reverb. The loudspeakers also have a cabinet angle for stage monitoring, and as noted earlier, the mixer can be snapped into the back of one of the cabinets. The other cabinet is provided with a lid that snaps into place to provide a storage area for cabling. The loudspeakers, which measure 22.4 x 13.2 x 12.5 inches (h x w x d) and weigh around 28 pounds each, have a handle on top for easy, balanced carrying as well as a locking pole connector on the bottom for stand mounting. Setting up the STAGEPAS 600i is a breeze, even for folks who've never hooked up anything bigger than an MP3 player to their earbuds! The loudspeaker outputs on the mixer, inputs on the loudspeakers, and even the molded 1/4-inch plugs, are colored a vivid red, so it’s pretty obvious what plugs in where. In addition, everything on the mixer is well labeled, and there are pictograms next to most of the jacks showing the correct plug. And, there's a large hook-up diagram on the snap-in lid of one of the loudspeakers. After quickly linking up the system, I fired it up and found that the sound quality is quite good, full and pleasing. I particularly like the master EQ knob that offers tailoring for speech or music. There really is no real estate left on the unit for even a small graphic EQ, so the knob is a smart solution. The SPX reverbs sound quite nice, and there's a choice of hall, plate and room verbs as well as an echo (delay) setting. The feedback suppressor is another nice touch and proved very responsive in eliminating squeals that we introduced on purpose to test it. The system gets quite loud and certainly delivers enough full-range output for many types of gigs, including spoken word, acoustic artists and even small bands. Since I already had the DXS12 subwoofer on hand, I added it to the system to find out how they sound together. Hooking up an external sub is straightforward, as the mixer has a dedicated sub output. Inserting a 1/4-inch plug into the sub output jack automatically engages a built-in high-pass filter, rolling down the low end of the STAGEPAS loudspeakers. If you want to keep the low end in the loudspeakers, the monitor outputs are also available. Adding a sub produces the thump that every 10-inch loudspeaker just can't produce, and nicely rounds out the overall sound. The STAGEPAS 600i is a real winner, with a complete mixer, overall flexibility, and plenty of output for a system of this quite compact scale. And, simply adding a sub makes it more than capable of handling larger acts as well as DJ applications. I know it's been a few years but...I have the Yamaha Stagepas 600i that I use for various presentations & music. We started doing Karaoke and I thought I'd add a sub to up the experience. 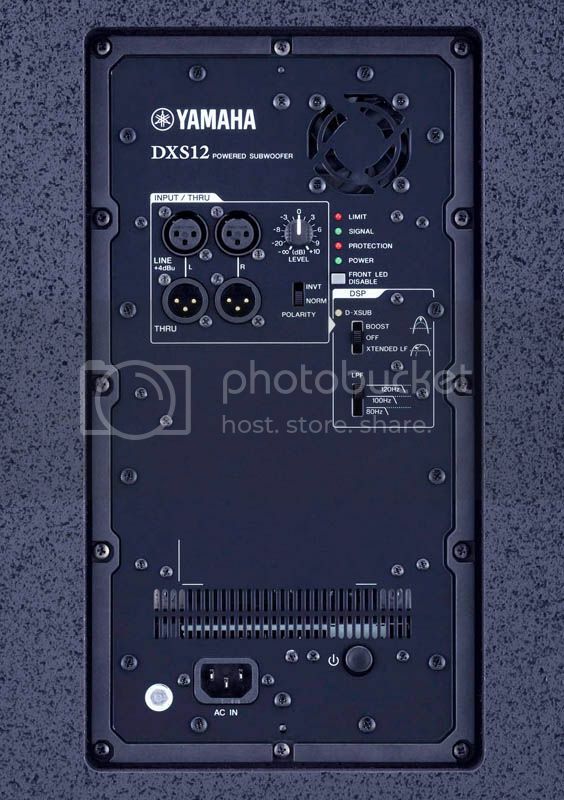 I ordered a Yamaha DXS15 but am not sure how to hook it up. You get a cable with 1/4" at one end to the sub out on the Stagepas, and XLR at the other end to go to the sub, and then either the L or R input is fine? I know it's been a few years but...I have the Yamaha Stagepas 600i that I use for various presentations & music. Please go to your profile and change the "Name" field to your real first and last name as required by the posting rules displayed in the header at the top of the section, and in the Site Rules and Suggestions in the Forum Announcements section, and on the registration page when you registered.